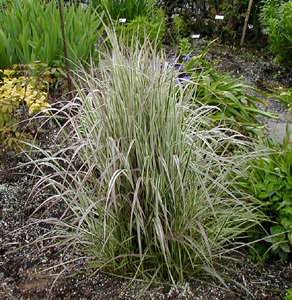 Joy Creek Photo Archive (c) all rights reserved The cream margined blades of Calamagrostis x acutiflora 'Overdam' form a less vigorous clump than the related form 'Karl Foerster.' The purple brown inflorescences only reach 4 feet in our gardens and fade to a gray pink. June. 4 ft. x 1 ft.